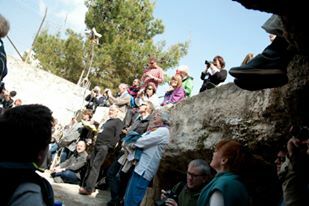 Participant from all over Sweden arrived in Bethlehem after various pre-conference witness tours. On Sunday evening, 25 March, Abla Nasir from the Sabeel Board welcomed the group on behalf of Rev. Naim Ateek who was returning from speaking engagements in Norway and the USA. Then Bo Forsberg along with Ingrid Ernstam and the choir welcomed everyone in song, “Kom och se!” by the end, everyone joined in the singing! Bo Forsberg continued his welcoming comments and mentioned that it had been his dream to have a total Swedish conference, especially after the 2011 Sabeel “Challenging Empire” Conference, he wanted more people from Sweden to come and learn the truth about what is happening in Palestine. Through his work along with Omar Harami in the Sabeel office and Sven Jansson, in the Diakonia Swedish office and the support of Bilda, this dream has become a reality. After the official greetings and recognition of the Sabeel staff, people continued to greet one another during the reception with wine and cheese before going to dinner at the Bethlehem Hotel. After dinner there was a showing of the film, “Occupation 101” and a time of questions and answers with Mazin Qumsieh. It was well attended and very informative for people to help further their understanding of the situation in Palestine. 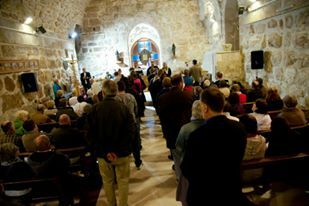 Each morning participants had the opportunity to go on early morning visits either to the Bethlehem checkpoint 300 or the Church of the Nativity. Most people took advantage of these offerings. At the checkpoint, we met with EAPPI participants to learn about their work on behalf of the World Council of Churches and the importance of having a Christian witness each morning at the area checkpoints. They even had the chance to go through the checkpoint and to be in solidarity with the Palestinian workers who each morning line up early in order to go to work in Jerusalem. At the Church of the Nativity, we met with George Canawati, a local tour guide, who shared the history and importance of the church as well as sharing his story of what it was like to live in the church for 40 days with more than 200 people during Israel’s siege of Bethlehem in 2002. Participants either walked or took the bus to Wi’am Conflict Resolution Center in Bethlehem near the wall. 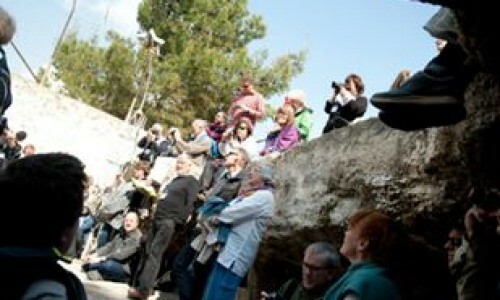 The opening worship took place in the garden area of the center with the Apartheid wall in the background. In February many of Sabeel’s Young Adults and international volunteers met to paint on the wall: “Kom Och Se!” with the three kings represented by “Monopoly” top hat man. As the kings from afar can to see what took place in Bethlehem many years ago, so are you invited to come and see what is happening in Palestine today! We were greeted by Zoughbi Zhoughbi, the founding director of the Wi’am center in Bethlehem. He reminded us that in the midst of the unholy trinity: refugee camps, the wall, and the settlements, the Palestinian people are the rolling stones who love life, he challenged the group to come, see, and act! “Who are you?” “Where do you come from?” might be simple questions, but for a Palestinian, they can be very complicated. She challenged people to resist evil without becoming evil. She mentioned that peace is fragile harmony. We are all accountable to one another, and to God. Darkness in NOT the last Word! Back at the hotel hospitality was shared through Fika and coffee! Nidal Abu Zuluf, manager of the Joint Advocacy Initiative (JAI), was moderator for the first session. Ray Dolphin from OCHA –the Office for the Coordination of Humanitarian Affairs gave a presentation on the topic: “Briefing on the Humanitarian conditions in the Occupied Palestinian territories.” The power point presentation is available on-line for those who want to use it.http://www.ochaopt.org/presentations.aspx is the site. He gave a great presentation and helped people understand the changes which have taken place over the years since 1948, and especially more recently with the continued growth of the Settlements and the Apartheid wall as it relates to human life, social, educational, medical, etc. Stephen Wilkinson gave a very impressive talk on with the title “International Humanitarian Law Program – Diakonia” He is an international lawyer and explained what the international law could and could not do. International Humanitarian Law only applies in international conflict areas; it does not prohibit all violence. He reminded us the duties of the occupying power are to protect the occupied population and they are obliged to provide for the basic needs of the local population. The occupier is not allowed to relocate the local people. International Law is superior to National Law. Check out www.diakonia.se/ihl for further information. After lunch at the hotel, we resumed for the afternoon speakers. Hania Kassicieh-Persekian, Program Coordinator of the Swedish Christian Study Center – Bilda, was the moderator for this next session. Bo Forsberg spoke enthusiastically about Kom Och Se! Come and See! – the purpose of this conference, in Swedish. After a fika and a coffee break, Nora Carmi, Project Coordinator of Kairos Palestie served as moderator. Göran Gunner spoke on “The Land, the Cross, and the Right – Christian Interpretations” in Swedish. Theology is a bridge between human beings and God. Liberation: the bridge cannot be built for people on one side when it enslaves people on another side. On 14 May 1948 at the age of 12, her world collapsed… she went to bed in Palestinian and woke up in Israel. The state of Israel was established for one people and the Nakba happened on another people. The homecoming for one people made another people homeless. She reminded us to seek the humanity of the oppressor with dignity. If we lose the ability to see humanity in the other we begin to lose our own humanity. There is humanity behind the uniform. Through her personal experiences, she beautifully shared these hard truths. Ched Myers has worked for three decades with many peace and justice organizations and movements around the world, today with the Bartimaeus Cooperative Ministries in California; he focuses on building capacity for biblical literacy, church renewal and faith-based witness for justice. 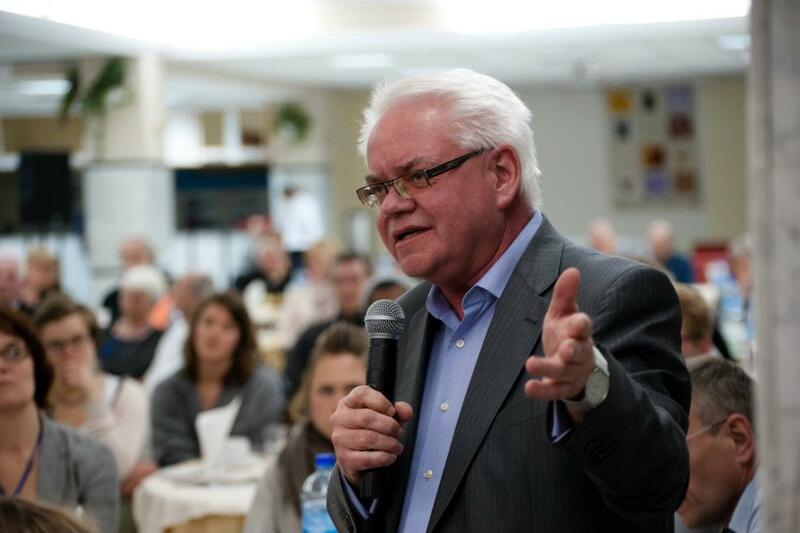 Ched Myers was invited to lead the conference bible study. This morning we looked at Luke 19:1-28: The Economics of Justice and the Cost of Discipleship. The bible study will be available to everyone and will be posted separately. Jesus continues to turn the tables upside down… in Jericho, Zacheaus, one of the most despised people as a Jewish chief tax collector, seeks Jesus. Jesus demands hospitality from Zacheaus, and this would have included all the people traveling with Jesus at the time… including the newly healed blind beggar! Zacheaus changes his life… and in giving back to the people he makes restitution for the wrong he had caused in his past! That was one powerful strategic meal! The land known as Dahers’ Vineyard was purchased in 1916 by Daher Nassar, the father of Bishara, and grandfather of the Nassar family who now run the Tent of Nations project. Since that time, many family members have worked the land by day, and slept in caves by night. The land has produced olives, grapes, wheat and other crops. In 1991, the Israeli government declared the whole area including the Nassar’s portion to be Israeli ‘state land’. The Nassar family has all the original land registration papers and contributed plenty of work to the land from the time of the Ottoman, British, Jordanian, and Israeli governance, which shows that the Israeli government has no right to declare it theirs, because obviously the land belongs to the Nassar family. The Nassar family challenged Israel’s declaration and therefore the case was brought to the court. In 2001, though the land case was still unresolved, the local council of Israeli settlements decided to build a road through the east side of the Nassar land. This was challenged, and the building stopped. Nevertheless, once again in 2002 the council took a decision to build a road all the way through the Nassar land, this time through the west side. The Nassars were able to stop both road projects through gaining the intervention of the Israeli courts. In 2005 the case of the land ownership was debated in the high court, and after many postponements the Nassar family was told that they could begin the process of registering their land with the Israeli authorities. A Palestinian refugee camp located in the southern West Bank along the Hebron-Jerusalem road in the Hebron Governorate. It is 15 kilometers south of Bethlehem. The camp’s total land area is 350 dunums and according to the UNRWA, in 2005, it had a population of 9,859 registered refugees. However, according to thePalestinian Central Bureau of Statistics (PCBS), the camp’s population was 7,941 in 2007. In 2002, two schools were built in the camp, one for boys and the other for girls. A Palestinian town located in a seam line enclave in the West Bank, four kilometers northwest of the city of Bethlehem is under the joint jurisdiction of the Bethlehem Governorate and the Jerusalem municipality. According to the Palestinian Central Bureau of Statistics the village had a population of 2,041 mostly Muslim inhabitants in 2007. The village has three mosques. It is also the site of al- Badawi, a 5,000 year oldolive tree, claimed to be the oldest in the world. The Diyar Consortium is a group of Lutheran-based, ecumenically-oriented institution serving the whole Palestinian community “from the womb to the tomb”, with an emphasis on children, youth, women & elders. Focusing on community building, development and outreach, Diyar implements contextual and holistic programs that support the civic, cultural, psychosocial, physical, educational, and spiritual wellbeing of the community. Diyar is the umbrella organization to which the Dar al-Kalima Health and Wellness Center, the International Center of Bethlehem (Dar Annadwa), and Dar al- Kalima College belong. Aida is a Palestinian refugee camp situated 2 kilometers North of Bethlehem and 1 kilometer from Beit Jala in the central West Bank. Named after a famous coffeehouse (maqhah) located on the site in the early 1940s, Aida camp was established in 1950 and covered an area of 66 dunams. According to the Palestinian Central Bureau of Statistics, the camp had a population of approximately 3,260 refugees in mid-year 2006. It is the location of the Al Rowwad Cultural and Theatre Training Center. The Aida Refugee camp is adjacent to a new 4-star hotel, thus juxtaposing Third World and First World lifestyles in close physical proximity. Pope Benedict XVI visited the refugee camp during his Middle East pilgrimage visit to Jordan, Israel & the Palestinian Territories in May 2009. Hebron is located in the southern West Bank, 30 km (19 miles) south of Jerusalem. Nestled in the Judean Mountains, it lies 930 meters (3,050 feet) above sea level. It is the largest city in the West Bank and home to around 165,000 Palestinians, and over 500 Jewish settlers concentrated in and around the old quarter. The city is most notable for containing the traditional burial site of the biblical Patriarchs andMatriarchs and is therefore considered the second-holiest city in Judaism afterJerusalem. The city is also valued by Muslims for its association with Abraham and was traditionally viewed as one of the “four holy cities of Islam. Lunches were eaten on site or in local homes; the meal was a traditional Palestinian meal of cucumber and tomato salad, mujadarah – rice, lentils and onions, which is served with yogurt. Each group ended the afternoon in Jerusalem on the Mount of Olives in the Garden of Gethsemane and the Church of All Nations for worship. Rev. Naim Ateekjoined everyone for the worship service. Sabeel made history during the service by inviting the Rev. Lisa Tegby to preside over the service of worship; this is the first time that a woman has had this honor and privilege at this location! Bishop William Shoumali, native of Beit Sahour and currently the Latin Patriarch of Jerusalem was the preacher for the service of worship. 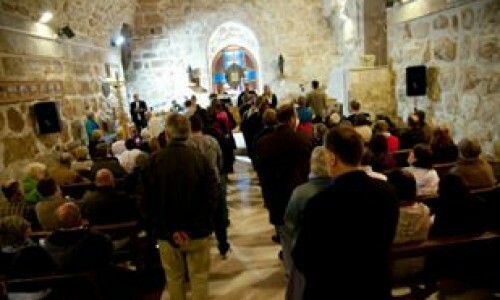 The service included music in Swedish, Arabic and English. During the prayers of supplication we were reminded of the great challenges the occupation has caused over the years, and the hope of Christ in the midst of everything. Dinner was enjoyed overlooking Jerusalem at the 7 Arches Hotel on the Mt. of Olives. Salwa Duaibis is an Israeli Palestinian currently living in the West Bank town of Ramallah where she heads the International Advocacy program at the Women’s Center for Legal Aid and Counseling, a non-governmental women’s rights organization to address the causes and consequences of human rights violations against Palestinian women in the occupied Palestinian territory. She is currently the secretary of the Sabeel Board of Directors. Salwa Duaibis was the speaker at the end of dinner. She inspired us with a few stories of the challenges and strengths of the Palestinian women. Ryan Rodrick Beiler, program administrator for the Mennonite Central Committee introduced Ched Myers for the second part of the Bible study on Luke 19:28-48: The Politics of Sovereignty and the Things that Make for Peace. The full bible study will be available to everyone at a later time. Ched reminded us that Jesus invites people to change… and then it is up to the people to decide. We have to be able to work with both kinds of people, those who decide to change, and those who do not! He challenged us to speak truth to power. Jesus came to Jerusalem to confront the temple and temple practices. As holy week approaches, bear in mind that as Jesus entered Jerusalem from the East, Pilot was also marching/parading into Jerusalem from the West. He ended the study with Jesus crying over Jerusalem with tears of lament, and a call for us to re-read scripture with the marginalized and the poor. The participants met in small groups for discussions. 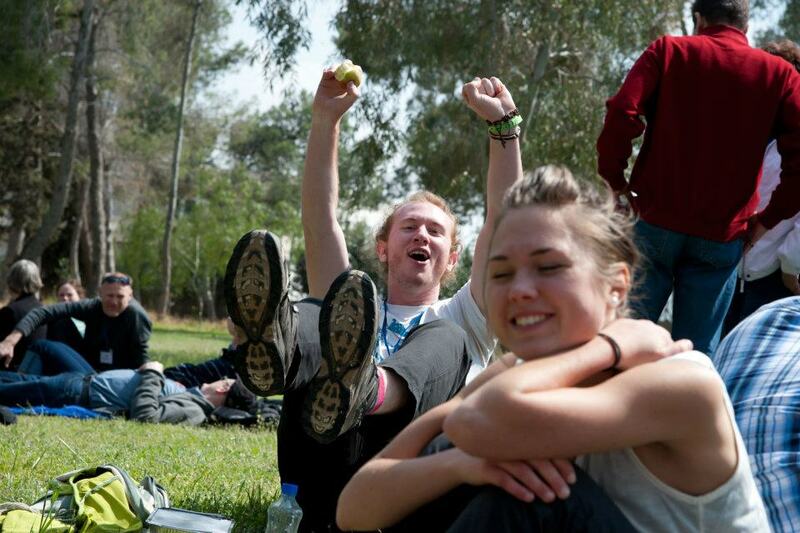 We went to the Shepherd’s Field by the YMCA in Beit Sahour for a picnic lunch. Then we journeyed to a cave, read scripture, and sang and danced to songs in Swedish, English, Arabic, and Zulu! After a break, Fika and coffee we returned for some more presentations from speakers! Musa Darwish, deputy director of Al-Liqa’ (Religious and Heritatge Studies in the Holy Land), introduced Hanan Alsana’. She is the director of the Education and Community Development Program at Sidreh Association, a Bedouin women’s organization in the Negev dedicated to promoting respect for Bedouin women’s rights. Hanan Alsana’ is a founding member of the first women’s Community Center to be established in an “unrecognized village” in the Negev. She is the founder of the first Arabic language feminist newspaper in Israel which has thousands of readers in 45 villages. She spoke about the challenges Bedouins are facing in the Negev and all around Israel. They prefer to live in the old traditional ways, but Israel continues to demolish their homes… some have been demolished more than 30 times. Hanan Alsana’ wanted an education, and after much negotiations with her father and brothers, she was allowed to go to the university. She is using her education trying to help her people improve their lives. Many Bedouin people do not know how to read, but over the recent years, that is slowly changing… and the women are working co-operatively in making beautiful woolen products that they are able to sell and provide some income for their family and community. For more information about this work, check out the following web site www.tveap.org. Rabbi Yehiel Grenimann from Rabbis for Human Rights introduced Dr. Deborah Weissman for the presentation on a Jewish perspective on the Palestinian Israeli Conflict. Deborah Weissman is the first Jewish women to serve as President of the International Council of Christian and Jews. Her main field of academic research is the social history of Jewish women’s education. In the past two decades, she has developed expertise in teaching about Judaism and Israel to visiting groups of Christian. Both locally and internationally, she is involved with Jewish peace movements in Israel, religious feminism and inter-religious dialogue. She has been part of an international, inter-religious think tank at the World Council of Churches. Deborah Weissman mentioned that she is pro Israeli and pro Palestinian, she is pro people and pro peace. She quoted Bishop Munib by saying, “As long as you believe in a living God you must have hope.” In regards to chosen people, she says that they are chosen for responsibility to do justice. The participants asked good and challenging questions that both she and Rabbi Yehiel Grenimann answered. For more information check out the following web site: www.iccj.org. Inter Styrbjörn from Christian Peacemaker Teams introduced Rev. Naim Ateekwho then lead the morning bible study, Jerusalem, What Makes for Peace! Naim Ateek is the founder and director of Sabeel Ecumenical Liberation Theology Center in Jerusalem. Naim Ateek began by stating that the solution to the conflict should be based on international law. The bible can however inspire us. We looked at several scriptures to gain a better understanding. Nehemiah 2:19-20 written after the exile is an exclusive text used by some Jews today to try to empty Palestinians out of Jerusalem. Psalm 87 written by a genius poet critics the Nehemiah text, in it God welcomes all people into Jerusalem, God is an inclusive God and Jerusalem must be shared! John 4:21-24 the woman at the well, when asked where should one worship, Jesus replies that neither in Gerezene nor in Jerusalem, God is spirit and must be worshipped in spirit and in truth. Because of the incarnation, God can be worshipped everywhere. There is not a theology of the land in the New Testament, only after the 4th century does place become important for some Christians. Revelation 21:1-5, life in the New Jerusalem verses Babylon, John saw the struggle between the city of beast and the land, it is a call to come out of Babylon to resist empire. We were reminded that the heart of the conflict in the Middle East is Palestine; the heart of Palestine is Jerusalem. Jerusalem must be shared, when a place becomes more important than people, we have strayed from God. Rev. Naim Ateek introduced Patriarch Michel Sabbah who spoke on the Kairos Document. Patriarch Emeritus Michel Sabbah was born in Nazareth in 1933 and was ordained a priest in 1955. He served in various parishes in Jordan, his last ministry being as a parish priest in Amman from 1970 until 1987. He was then elected patriarch of Jerusalem for the Latin Catholic Church. 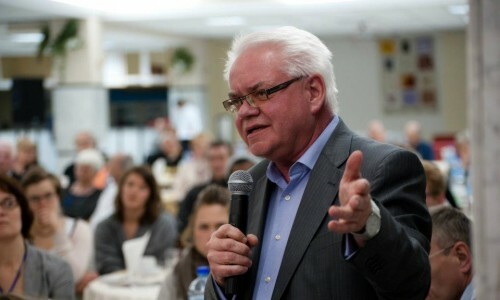 He retired in June in 2008, and continues to speak widely on pertinent topics related to the Palestinian population. He is one of the writers of the Kairos Palestine document. He called for people to continue to resist with love and hope. We should all seek human dignity through the ways of love. For more information on the Kairos document, check out the following web site: www.kairospalestine.ps. Kathy Bergen, program coordinator for the Friends International Center in Ramallah, introduced Gerard Horton who spoke on the Palestinian Children prisoners. Gerard Horton is a lawyer at Defense for Children International (DCI), chhis is an international organization working in the West Bank, Gaza and Israel in the field of promoting and defending the rights of children. Gerard has worked in the region for five years with a focus on Palestinian children detained and prosecuted in Israeli military courts. Gerad Horton reminded us that imprisoning children in Israel is illegal. Children are arrested every night in the West Bank. The psychological impact upon the children is huge… and the physical impact is overwhelming with children who later develop eating disorders, bed wetting, and other forms of physical systems. When a child is arrested the whole family structure is disrupted. Many families however do not file complaints because they fear further restraints and because they get nowhere with them! 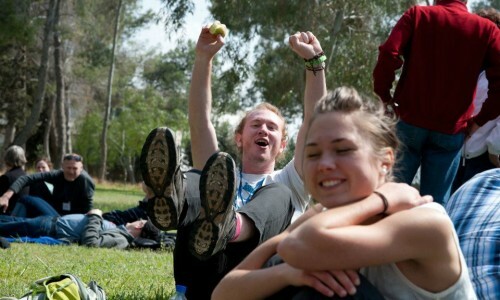 Gerad Horton shared a scenario of two boys throwing stones… one a Palestinian and the other an Israeli. For the same action there are two very different outcomes. For the Israeli, most likely he will be disciplined, in the presence of his parents, and let go after a short amount of time, all during the day light hours. For the Palestinian, most likely he will be taken from his home in the middle of the night, without his parents, without possibility of bail, and no one knows how long it will take for his particular situation to be resolved. For more information please check out the following web site: www.dci-pal.org. 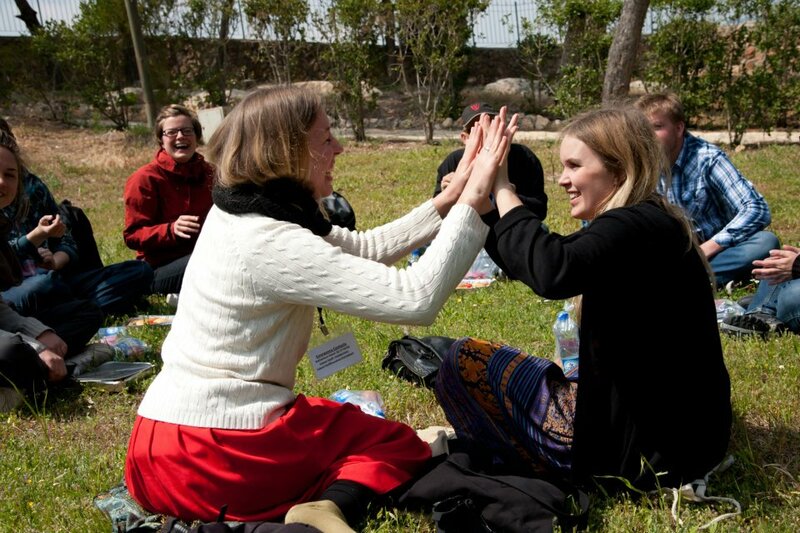 The participants met after lunch to talk about what they will do when the go back to Sweden. They had hoped to have a document by the end, however not all were able to agree on a final statement. The young adults of the conference led a group in a non-violent protest at Manger Square in Bethlehem. There was singing, walking and holding of pictures from the Nakba. The closing worship was held at St. Francis Church. Rev. Karin Wiborn, an ordained pastor in the Baptist tradition was the preacher for the worship. She has served as the General Secretary of the Baptist Union of Sweden until 2011 and currently the General Secretary of the Christian Council of Sweden. Ephesians 4:1-6, and John 1:35-42 were the scriptures read during the worship service. Rev. Karin Wiborn preached in Swedish. There was great music by the congregation, the youth choir and the conference choir. Communion was served at the end of worship with Rev. Naim Ateek presiding. A delicious dinner was served at the Casa Nova Hotel. Special recognition was given to Olivia Sporre who volunteered at the Sabeel office for six months and helped greatly with the conference behind the scenes activities leading up to the conference! Also special thanks were given to Omar Harami of the Sabeel office, Naim Ateek and the Sabeel office, Sven Jansson of Diakonia, and Bo Forsberg for the inspiration of this conference, and Ingrid Ernstam for leading everyone in music! Following the dinner, we went to the Church of the Nativity for a beautiful evening of music by the Edward Said conservatory; they presented a Lenten Hymnal Concert! Sawsan Bitar, Sabeel staff over the clergy programs, was the emcee for the evening.